Hello ... Hello ... my old friends ... It's great to see you once again! 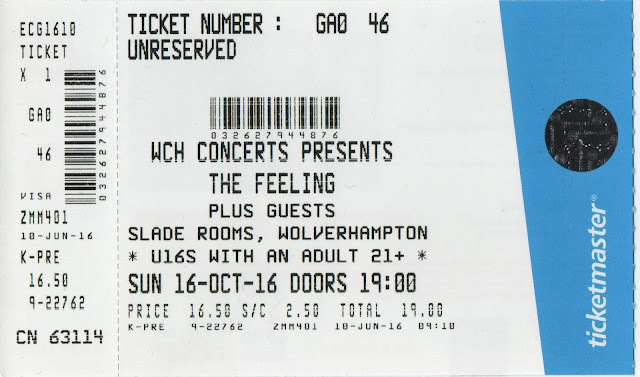 When Yours Truly KJS found out that Iain Hornal was to support The Feeling for their Autumn tour dates prior to their self imposed hiatus, I was thrilled. Iain, fresh from his acclaimed performances in Jeff Lynne's ELO on either side of the Atlantic and The Feeling, also fresh from their impressive support slot on the "Alone In The Universe" tour and their Summer festival dates, combined powerfully to present a memorable evening of the highest order in front of the packed house at The Slade Rooms here in "Down Home Town" Wolverhampton last night (Sunday 16th October). First up was the effervescent Iain Hornal who delivered a sublime acoustic set comprising eight classy songs in a wonderfully confident manner to charm those assembled. 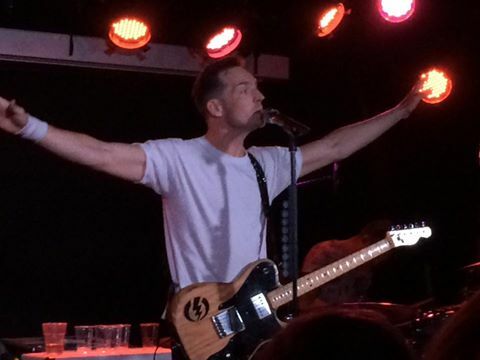 "Quit You", "Running Away", "Jennifer" and "She Doesn't Have Anyone" all bode well for Iain's forthcoming as yet untitled album, due out in January 2017. And with contributions from the likes of 10cc legends Graham Gouldman and Kevin Godley as well as Sophie Ellis-Bextor and (of course) The Feeling. it's a recording to truly look forward to. Watch that space! Iain Hornal performed: "Quit You" ~ "Any Other Way" ~ "Running Away" ~ "Drop This Song" ~ "Everybody Needs A Helping Hand" ~ "Pictures Of Past" ~ "Jennifer" ~ "She Doesn't Have Anyone"
Based on their showing last night, you cannot come to any other conclusion that The Feeling are a proper band. No clichés and no excuses. I kinda missed them the first time around for various reasons but the way they owned the stage and prompted the crowd during their set spoke volumes for a band at the top of their game celebrating and enjoying their longevity whilst punching out their hefty legacy of catchy rock anthems with a deft touch of keys and some astounding percussion work. Their fans were so in tune with the band that they were a part of the show, much to the delight of both as Dan Gillespie Sells - leading his polished quintet from the front - belted out their hits and more) including the beautiful "Rosé" , the anthems "I Thought It Was Over", "Never Be Lonely" and "Love It When You Call" plus newer tracks "Spiralling" and "Feel Something". Perhaps the surprise of the night (for this writer anyway) was their bostin' cover of The Buggles' "Video Killed The Radio Star". I certainly didn't expect it but it topped off the night perfectly. We look forward to the return of The Feeling in 2018. The Feeling performed: "Fill My Little Fanfare" ~ "I Want You Now" ~"Fill My Little World" ~ "Anyone" ~ "Without You" ~ "Helicopter" ~ "Spiralling" ~ "Rosé" ~ "Strange" ~ "Blue Murder" ~ "Never Be Lonely" ~ "Kettle's On" ~ "Sewn" ~ "Join With Us" ~ "Love It When You Call" ~ "I Thought It Was Over" ~ "Video Killed The Radio Star" ~ "Feel Something"
elobeatlesforever (elobf) recommends Iain Hornal and The Feeling to those enlightened folks who enjoy the music of ELO, Jeff Lynne, The Move, Roy Wood, The Idle Race, 'Brum Beat', The Beatles and related artists. 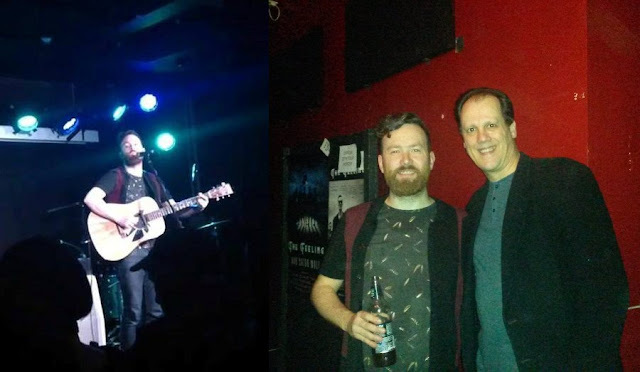 Loved The Feeling when they supported Jeff,had a couple of their CDs already.I spoke to Iain at The Donkey when he supported Pugwash and must be honest, for me personally he stood out and was my star of the night, he is underestimated for sure, can't wait for the next album from him. Yes, I agree with other comments here: Iain Hornal is talent semi-below the radar the world needs to wake up to! If John Peel were still here I'm sure he'd plug him. Check out his superb and unique 2017 album, peops, and his YouTube channel has some lovely songs not on the album, and... there are other gems to come? Iain's singing of Fill my Little Fanfare (using Fill my Little World lyrics) played before The Feeling's Autumn gigs in 2016 is stop-you-in-your-tracks-good (you can buy it but with his name mis-spelt?). Saw his band Hornal live in February this year, and solo as warm up to Tony Christie recently: brilliant! As I already have quite a few ELO albums, I bought Jeff's Wembley Or Bust CDs/DVD set on the basis of the fab up-to-date production values and the luscious harmonies Iain and Melanie provide as part of the 13 piece beefed-up live ELO sound. The Feeling did not play the final added date of the ELO tour I saw on 24? June 2016 so I look forward to seeing them 9 days after ELO this October on their 12 Stops and Home anniversary tour, both in Jeff's home town.